#MFB: 3 1/8" x 2 3/16" booklet closed; 3 1/8" x 4 1/2" when opened flat. Includes 125 Mylar flags (25 each of 5 colors). #MFPB: 5 1/4" x 3 1/16" booklet closed; 5 1/4" x 6 1/4" when opened flat. Includes 125 Mylar flags (25 each of 5 colors) and a 3" x 3", 25 sheet adhesive notepad with white paper. Shipping: Catalog quantities ship in only 7-working-days! 2-day service at ground rates. BIC Air Express 1 Day Air. 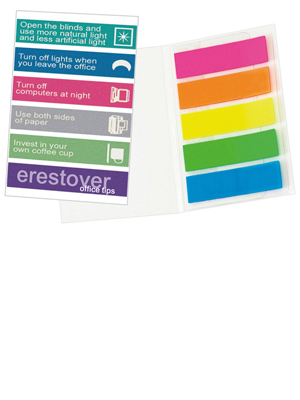 Since BIC Sticky Note products are heavy, please Click here for complete shipping information. Imprint: Price includes a FREE 4-color process imprint on the booklet cover! 4-color process allows you to print as many different colors as you want for one price! All PMS colors will be converted to the closest 4-color process match. A perfect match cannot be guaranteed. Click here for standard imprint colors. Imprints are not available on flags. Add $.10 per pad for 4-color process notepad imprint. Orders with imprinted notepads must be placed in 500 piece minimums and increments. Add an additional 2-working-days for imprinted notepads.